Document holder keeps documents between the monitor and keyboard to help reduce head, neck and eye movement. Design offers a versatile angle and height adjustment for easy viewing. 14 wide, transparent backplate supports wide and heavy documents. Elastic line guide enables easy data entry and helps keep up to 150 sheets in place. 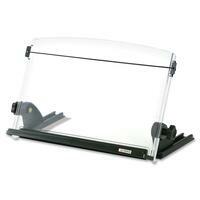 Document holder includes a skid free base and is made of 40 percent pre consumer recycled material.